This is how my hands look at the end of nearly every day. I don’t mean to do it. It just kind of happens. When’s the last time you did something where your hands got dirty? 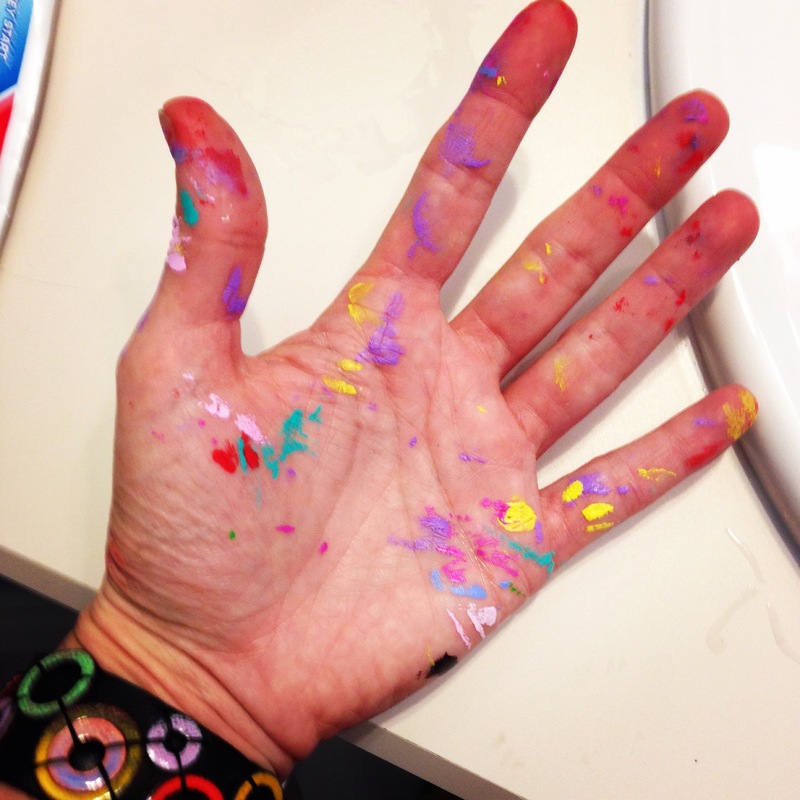 This entry was posted in Art and tagged acrylic, artists, dirty hands, messy, paint, painting. Bookmark the permalink. “…something where [my] hands got dirty?” The G-rated version, or the ___-rated version? Mmm. These days I’m pretty clean, Professor. I’m just so dang grateful to be alive. I think all my naughtiness melted away. I’m not kidding. Who knows, maybe that part of me will come back in time. You think? Well, I didn’t say I’m pure 24/7. Not possible. The last time my hands were REALLY dirty was last Thursday. Even though the garage floor stays clean, I can’t seem to complete an oil change without making a mess of my hands. I certainly don’t get the same colorful effect as you’ve achieved either. Do you mean other than picking my nose? Hahahaha. Okay, that’s a photo I’d love to see. You with your nasty boogery hands. In the kitchen, making homemade meatballs for my two friends undergoing breast cancer surgery in the same week. Wow. Talk about a wake-up call. But the messiness was therapeutic! Hi Kay: Now that’s my kind of dirty. Yummy dirty. I take it you cook when you are having a rough time. i get it. I paint or doodle or write. Cooking can be wonderful, too. I hope your friends are okay. I really do. It’s the time of year for miracles, big and small. Anytime I cook. Every time I cook? It’s not just hands, but face, hair, clothing, floor, and a couple of times, the ceiling. But it’s all good. It’s just not fun to clean up. There was a girl I remember in college who didn’t say much. We had an English class together, but she was an art major. On days she came in with paint on her hands, she seemed happier. On days she came in with paint on her hands, in her hair and on her jeans? Euphoric.